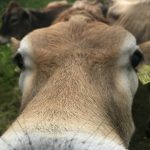 The very distinctive and rather charming Jersey cow has become the 2nd most popular dairy cow in the world. The average registered pedigree Jersey cow in the UK now produces 6024 litres of milk per year with a butterfat content of 5.46% and protein of 3.83%, with the best individual animals yielding around 9000 litres or higher. Jersey milk is in many ways unique. As a product it contains:- 18% more protein, 20% more calcium, 25% more butterfat than average milk. The Jersey Cattle Society of the United Kingdom keeps the national herd book and promotes the breed. 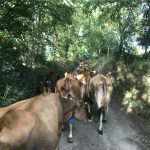 Our herd was founded in 2018 with the purchase of heifers and young cows from three well known pedigree herds: Quintrell Jerseys (Cornwall), Sunnydawn Jerseys (Devon) and Hollesley Jerseys (Somerset). In milk cows were added from the dispersal of the Hartlandview (Devon) and Kingtonhills (Herefordshire) herds. 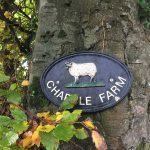 We aim to continue to grow our herd in 2019 and by the end of 2020 our first home bred heifers under the Chapple prefix should start to enter the milking herd. We operate an extensive, simple system in which we look to maximise milk from grass. 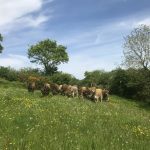 Grazing their way around the farm in spring, summer and as much of autumn as the weather allows we only house our cattle for the worst winter months. 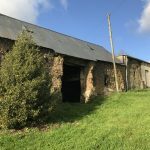 Grass silage is offerd throughtout winter and as a buffer feed when required. During twice daily milking in our 12:24 DeLaval parlour each cow is topped up with an individual ration of cake that is calculated according to yield and stage of lactation. We are pround to supply our milk to Davis & Parsons Ltd who specialise in the wholesale of Jersey milk to British food manufacturers.